Physical therapists are movement specialists, and we use biomechanical assessment to study a patient’s movement. With this assessment of posture, mobility, strength, and flexibility, we gain a better understanding of forces imposed on the body to gain insight into pain and dysfunction. This assessment can also help us gain insight into injury prevention to keep you moving. 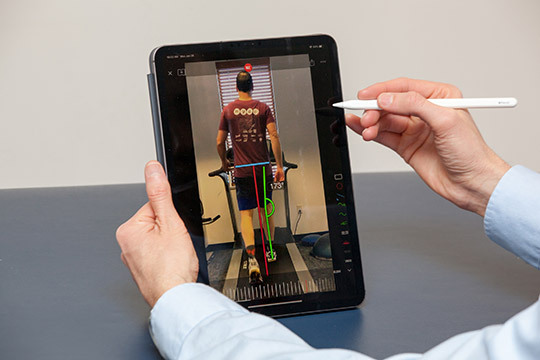 Along with a biomechanical assessment, we can analyze your running (or walking) form through iPad® video analysis to look at dynamic movement. We truly believe that more answers are accurately found through the use of slow-motion video. By combining our biomechanical assessment with iPad® analysis, the “puzzle” that creates pain and dysfunction can be solved through exercise prescription, sneaker/orthotic modifications, and training recommendations.